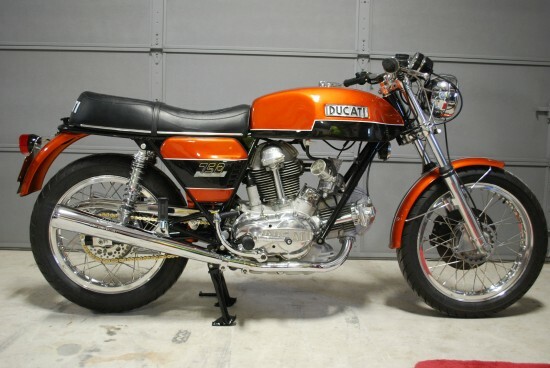 The Ducati GT750 was the first street Ducati to use their famous “L-twin” engine, so named because the 90° v-twin was oriented with one piston pointing forward and the other directly upward, forming the shape of the capital letter “L”. 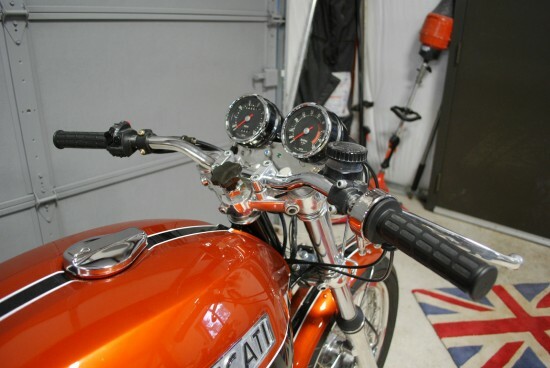 Introduced in 1971, the 748cc engine produced a claimed 60hp and could push the unfaired bike to a top speed of 125mph. Looking back, it is a bit less glamorous than the Sport and Super Sport models that followed, but don’t let that fool you into thinking the GT is boring or bland: those later bikes, while possessed of sexier styling, were also far less comfortable and practical. For most riders, the GT was a do-it-all bike for weekend rides, commuting, backroad scratching, and even light touring, offering character along with reasonable comfort. 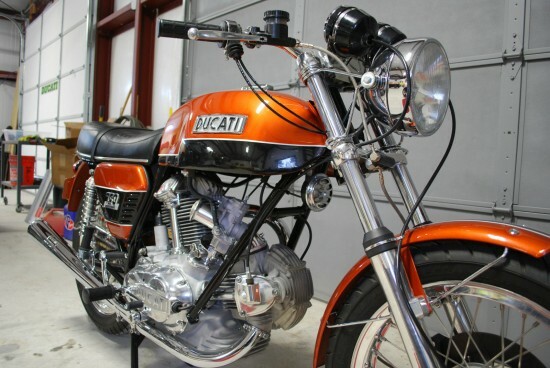 Today’s Ducati GT750 strikes a balance between originality and function. The restoration by Austin Vintage Cycle keeps the spirit of the original bike, but manages to improve it in subtle ways that might be lost on casual viewers because they are so well executed and suit the bike so well. We purchased this bike from Arizona and it was a bit of a mess when we received it. It was missing a few parts as the previous owner had started to take it apart for some unknown reason. 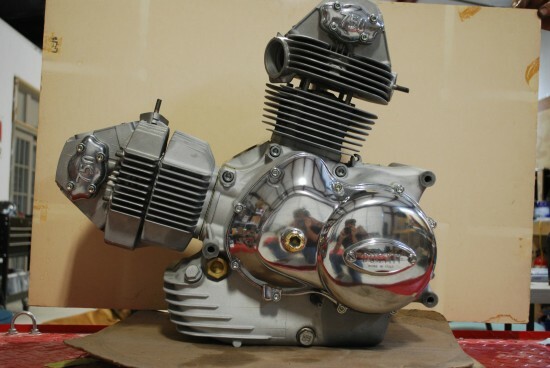 The decision was made to take it completely apart and restore as much of the original hardware, fasteners, and parts that were original to the bike. We also made the decision to perform and add a few very minor upgrades. These were the things that we would have done back in the 70’s just to give the bike a cleaner look and a bit better performance. Our goal with this build was to build to show / museum quality, but also to the level that we expect to have in a bike that we would ride. This bike can be ridden with confidence if one chooses to do more than just show it. It has undergone a complete nut and bolt restoration with every part and piece of the bike disassembled, cleaned, painted, massaged and sorted. There is not a single part on this bike that has not been touched in some way. As much original equipment as possible has been retained in this restoration. All of the original levers such as kick start; shifter, brake etc. were cleaned and re-chromed by a reputable chrome shop; original center axle Marzocchi forks with rear mounted Scarab type caliper mounting flags. The headlight bucket and ring were also re-chromed. The motor still had its original seal on the crankcase, but we decided to split the cases anyway as it has sat for so long and we wanted to make sure that there were no sins lurking inside. The good news is that the crank and rod assembly were in very nice condition and did not need attention. This did however give us the chance to check and replace bearings, assure all transmission gears, splines, shafts and bearings were ok. We removed the sludge from the crankshaft sludge trap. 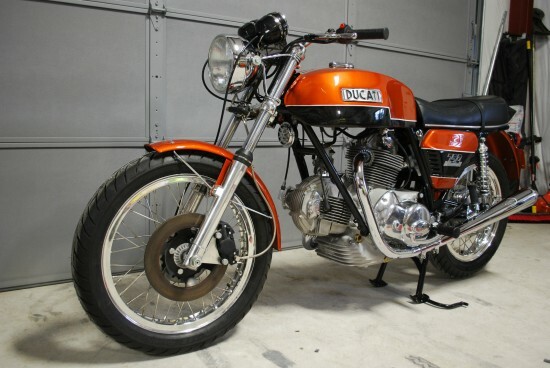 We decided to go back with the original bright orange/ black color scheme on this restoration. All of the original aluminum parts have been cleaned, and or polished. No expense or time has been spared in this restoration. Ignition and wiring has been upgraded to modern standards. The following is a list of what has been done to this Ducati. The motor starts first kick and settles into a very nice, smooth idle. This bike runs and shifts better than the day it was delivered from the factory. Restorations of old vehicles can be tricky: sometimes, “original” doesn’t necessarily mean “good”, and the temptation to improve factory flaws or performance can be hard to resist. But where do you draw the line? A modern ignition system is virtually undetectable in most cases, and improves performance significantly. But what about cosmetics? What amounts to tasteful, and what amounts to heresy? To me, this bike walks that line perfectly, and Ducati fans seem to agree, with bidding north of $24,000 at the time of writing. It’s unbelievable what these bevel head Duc’s are going for! Whats the driver behind these prices? Considering what muscle cars go for these days, it’s no surprise that people are ponying up huge amounts for blue-chip bikes. I mean, I guess $25,000 really isn’t all that much money for an awful lot of folks out there… It’s just a shame, since it puts bikes like this out of reach of the rest of us.